In the course of our survey of the events of history that led to the creation of the state of Illinois, we have seen how the Indiana Territory was founded on July 4, 1800, encompassing territory that included the future states of Indiana, Illinois, Wisconsin, part of Minnesota, and half of Michigan. The first territorial governor, appointed Jan. 10, 1801, was William Henry Harrison, future hero of Tecumseh’s War and the War of 1812 and U.S. president. According to Illinois Gov. Edward Dunne’s 1933 “History of Illinois,” the entire Indiana Territory then held a population of less than 6,000 souls. 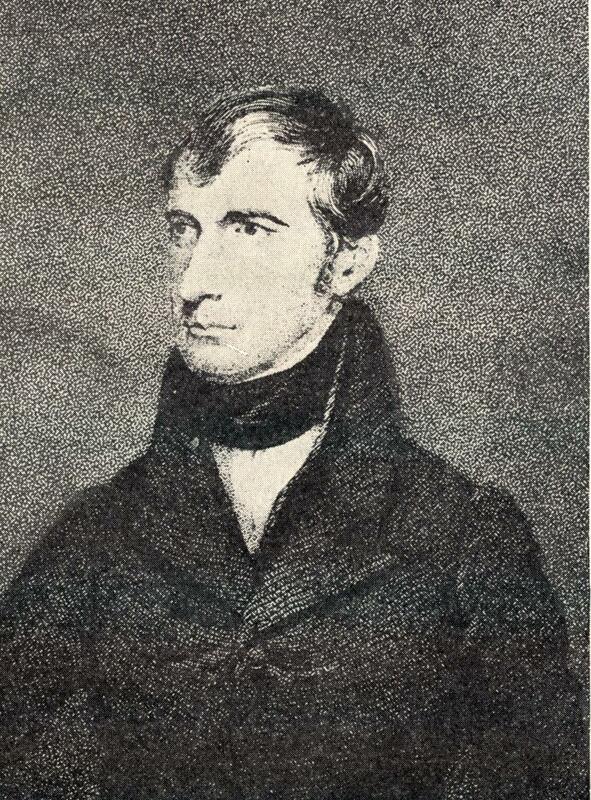 William Henry Harrison, first territorial governor of Indiana (which then included Illinois), would later briefly serve as U.S. President in 1841. As a part of the Indiana Territory, Illinois was included in three counties – Knox County (made up of Indiana and eastern Illinois), Randolph County (southern Illinois), and St. Clair County (the bulk of Illinois as well as Wisconsin and Minnesota). The Illinois Country was then peopled mainly by Native Americans and relatively small groups of French settlers. Dunne says there were about 1,500 French, but 2,500 Americans of British origin had already settled in Illinois by that time. Meanwhile, territorial leaders and land speculators were laying the groundwork for further westward expansion and encroachment upon Native American lands. Dunne notes that when the Indiana Territory was formed, “All of Illinois except the land on and surrounding the French villages owned and occupied by the French, was an Indian reservation recognized by American law.” But as we have noted previously, from 1773 to 1819 a series of land purchases and treaties were made with the Illini, Piankeshaws, Kaskaskias, and Kickapoos that extinguished Native American title to most of the lands of future state of Illinois, opening the land to further European-American settlement. 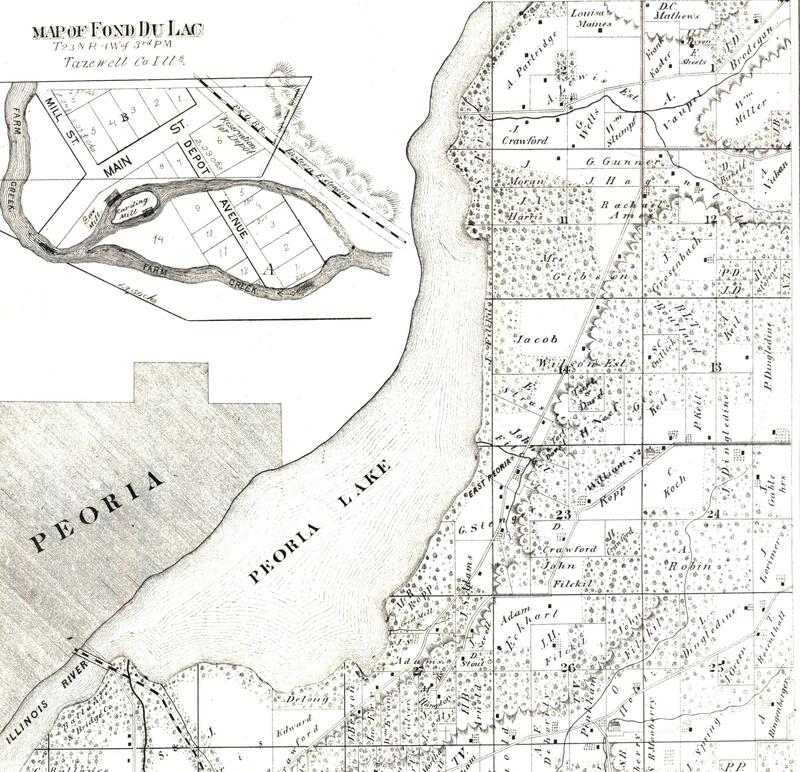 The future site of Peoria (then La Ville de Maillet) was included in the 1795 Treaty of Greenville, and the future Tazewell County was included in the lands ceded to the U.S. by an Aug. 13, 1803 treaty with the Kaskaskias and a July 30, 1819 treaty with the Kickapoos (in the year after Illinois statehood). On Dec. 4, 1804, Gov. Harrison proclaimed that the population of the Indiana Territory was high enough that its citizens could legally elect a representative legislature. Among the representatives elected the following month were Shadrach Bond from St. Clair County and Pierre Menard from Randolph County. Bond, who previously was elected to the Northwest Territorial Legislature in 1799, later became the first governor of the state of Illinois, while Menard would serve alongside Bond as the first lieutenant governor of the state of Illinois. 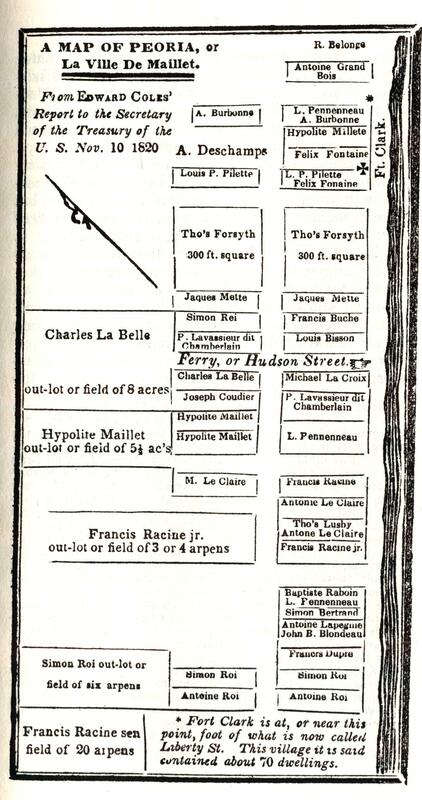 Both Menard and Bond would have Illinois counties named after them, and Menard’s son Pierre Menard Jr. would live for a while in Tremont and serve as a sub-Indian agent at Fort Clark (Peoria). According to Dunne, at the time of the Jan. 1805 Indiana territorial election, the population of Illinois proper was probably around 6,000 to 7,000 souls. The 1800 U.S. Census had counted 5,641 people in the Indiana Territory, including 2,458 in the area that would later become the state of Illinois. Only four years elapsed from Indiana’s first territorial election until the territory was further divided in order to create the Illinois Territory in 1809, made up of the lands of the future states of Illinois, Wisconsin, and parts of Minnesota and Michigan. Ominously, the primary issue that led to Indiana being broken into separate territories was the one that would eventually tear the country in two during the Civil War – slavery. As early as 1796, territorial leaders had petitioned the U.S. Congress to repeal Article 6, but Congress denied the request. A second petition to allow slavery, with language that called for gradual emancipation of slaves, was drawn up in 1801, but again Congress denied the petition. Undeterred, the pro-slavery group gathered in a convention in Kaskaskia, Ill., in 1802, where they prepared a “memorial” asking Congress to suspend Article 6 for ten years. Again the request was denied. Thwarted by Congress, Gov. Harrison and the Legislature attempted an end run around Article 6 by passing an unjust contract law that slave owners could readily manipulate to coerce their slaves brought into the territory to agree to continue to serve their masters. Following the Louisiana Purchase of 1803, the inhabitants of two of Illinois’ three counties petitioned to become a part of the new Louisiana Territory, where slavery was legal. Congress denied their petition. Two years later, a bill was introduced into the Indiana Territorial Legislature that would ask Congress to allow slavery in the Indiana Territory, but the bill failed to pass both houses. According to Dunne’s history, by this time the settlers in the future state of Illinois had grown bitterly opposed to the “arbitrary rule” of Gov. Harrison and his appointees. Seeking a change in government for that reason as well as to find a way to get out from under Article 6’s anti-slavery law, in 1806 the Illinois settlers decided to petition Congress for the creation of a new, separate territory. Like the previous petitions, it was rejected. The same year, the Indiana Legislature held a special session to once more debate making slavery legal, but the outcome was inconclusive. In 1807 the people of the Indiana Territory elected Virginia-born Jesse B. Thomas (1777-1853) as their delegate to Congress. Thomas, who would later serve as a U.S. Senator for the state of Illinois, secured his election as delegate by promising the separationist settlers that he would advance their cause in Washington, D.C. Keeping his promise, Thomas worked diligently to help advance an act in Congress to create the new Territory of Illinois. President Thomas Jefferson signed that act into law on Feb. 3, 1809, and the new territory was formally erected on March 1 of that year. 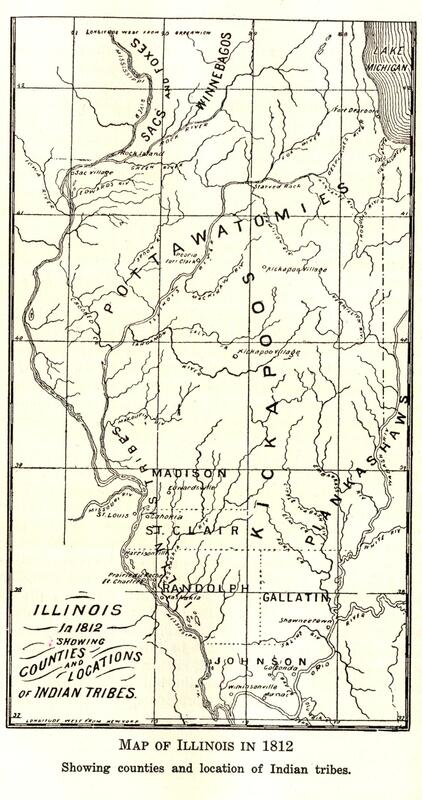 Dunne says that estimates at the time were “that there were 17,000 people east of the Wabash in Indiana and 11,000 west of that river in Illinois.” The following year, the 1810 U.S. Census counted 12,282 inhabitants in the Illinois Territory. 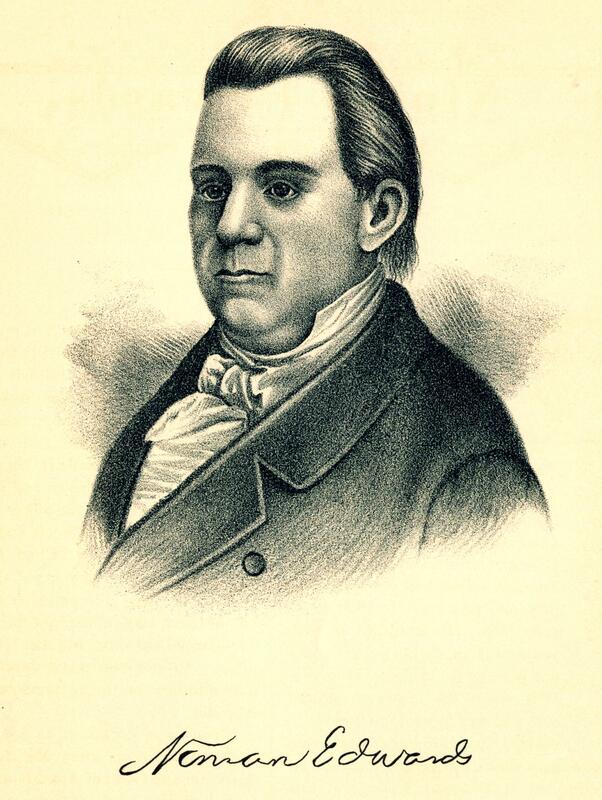 Illinois’ first and only territorial governor was Maryland-born Ninian Edwards (1775-1833), governing from Kaskaskia. He would be appointed to three consecutive terms as territorial governor, and later was elected Illinois’ third state governor. Next time we’ll take a look at the momentous events of Edwards’ time as governor.